Self-care for mothers is often, ignored in the rushed days of school pickups, nighttime feeding, cooking, cleaning, washing, laundry and more! Self-care is moved to the bottom of the list and often, ignored, neglected and forgotten. With the Finlee and Me Self-Care for Mothers eBook and workbook package, you get the perfect combination of easy-to-implement ideas with proven-to-work tools and strategies so you can make self-care an integral part of your everyday life with ease. The Finlee and Me Self-Care for Mothers ebook and workbook package will give you the ideal mix of implementable ideas and proven tools and techniques to make intentional self-care easy, effortless and even, economical. 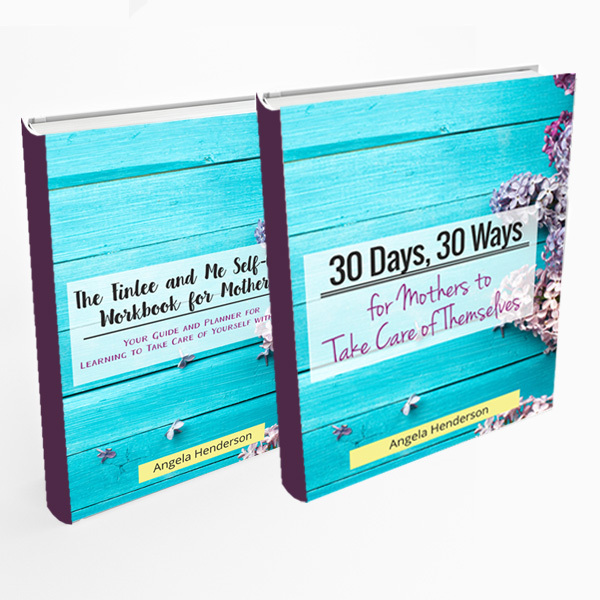 You’ll get the 30 Days, 30 Ways for Mothers to Take Care of Themselves eBook and the Finlee and Me Self-Care for Mothers workbook so you can have both the self-care ideas and the intentional reflection exercises to help you actually implement those ideas with ease. You’ll love the Finlee and Me Self Care for Mothers eBook & Workbook Combo package since it will give you 30 easy-to-do self-care ideas and a beautiful 36-page workbook to help you be more intentional about your self-care on an everyday basis. You’ll love the practicality of the eBook and the intentionality of the workbook and how they’ll both make caring for yourself SO much easier. She knows, first-hand, the challenges that busy mothers face when it comes to their own self-care. As a result, she’s drawn from personal experience and created an eBook and workbook that will work wonders to add intentional, inspired self-care to your busy days. What can I say? These books are so spot-on – empowering without being too in your face about it all. The layout is so pretty and they are so easy to read I honestly didn’t notice the time going by – (I actually am counting this as ‘me’ time). Within the Self-Care workbook I recognized sooo many ways I can take better care of myself. Angela is inspiring with her ideas and has left me feeling positive and ready to improve. For me. To be honest, this is no mean feat. I had so many options for improvement I could have seen this as somewhat of a failure. But not with Angela! I genuinely feel like I can do this. 30 Days, 30 Ways is the perfect addition, as this has helped give me a bit of a kick start. Just one small thing every day can make a difference. Granted, I’m only on day 3 but I am so proud of myself for growing (get me with the positive words!) 3 days in a row. Lets face it, sometimes, as a mummy, it’s a struggle to get dressed 3 days in a row. So we all know this is a real bona fide achievement. A massive thank you, big hug and 5 peaceful mummy-minutes to Angela for these inspiring books. They are a must for all mummies out there. They download instantly so go get yours, find a quiet corner and enjoy. I’m away to pick a nail polish shade for tomorrow’s mummy-moment……..